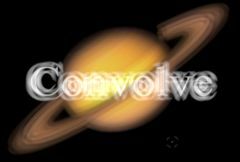 Convolves a source image with a kernel. Convolution is a mathematical operator which uses one image, the kernel, as a filter shape for another image (the source). Convolution effectively stamps a copy of the kernel at each point of the source, using the source's brightness at that point. The effect is that a copy of the kernel will appear over all the bright spots of the source. A kernel image shaped like a circle or polygon will give an effect similar to RackDefocus; a kernel image shaped like a starburst can give something like Glare. Kernel Size: Default: 1, Range: 0 or greater. Kernel Size resizes the kernel larger or smaller. 1.0 is the original size. This parameter can be adjusted using the Kernel Size Widget. Kernel Rel Width: Default: 1, Range: 0 or greater. Kernel Rel Height: Default: 1, Range: 0 or greater. Brightness: Default: 1, Range: 0 to 1e+005. Any source value below this will be treated as black. When combining the convolved result with the original, you can increase this value to only convolve bright areas of the source. Typically when using this parameter, you will also set Combine to Screen or Add to get a glare-like effect. Determines how the convolved image is combined with the original source. Screen: Screen the convolved image with the original source. Use this option for a glow or glare-like effect. Add: Add the convolved image to the original source. Difference: Show the difference between the convolved image and the source. Interpolates between the convolved result (0) and the original source (1). 0.1 can give a nice misty effect since it mixes only a little of the source in. Edge Mode: X & Y, Popup menu, Default: [ Transparent Transparent ]. Kernel Crop1: X & Y, Default: [-0.997 -0.747], Range: any. Kernel Crop2: X & Y, Default: [0.997 0.747], Range: any. Show Kernel Size: Check-box, Default: on. Turns on or off the screen user interface for adjusting the Kernel Size parameter. Show Kernel Center: Check-box, Default: off. Turns on or off the screen user interface for adjusting the Kernel Center parameter. Show Kernel Crop: Check-box, Default: off. Turns on or off the screen user interface for adjusting the Kernel Crop1 parameter.